28th September 2000 Important Visitors. 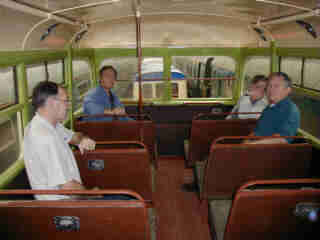 Left to right, Mike Flynn from the Wellington Transport Museum, New Zealand, Ken Blacker, Chairman of the London Trolleybus Preservation Society, Roy Makell from the London Trolleybus Preservation Group and our own Roy Austen, secretary of the Hastings Trolleybus Restoration Group, admiring the top deck of the Sunbeam. 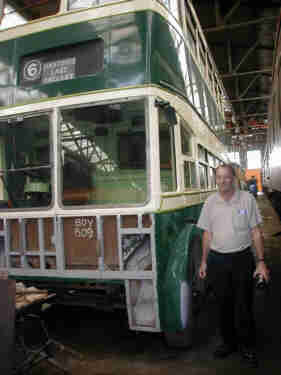 The London Trolleybus preservation society, based in Carlton Colville near Lowestoft in Suffolk are the owners of the Sunbeam.